With the changing trend in the way companies interact with their potential customers, content marketing has powerfully captured the advertising platform. The colossal success of Buzzfeed was due to its capability of coming up with content that could trigger the readers' emotional aspect. Similarly, ScoopWhoop, Buzzfeed's clone in India became successful by coming up with interesting listicles which make the reader associate themselves with the content. Today, due to the increased competition between listicles producing websites like ScoopWhoop, Indiatimes, Popxo etc. it has become an enormous challenge for them to come up with trending and appealing content. They do not sit and merely guess the topics which might interest the people. Rather, they used experimentally proven techniques to research what's trending on the web. Earlier, before the era of Internet, limited space in print and display media was dedicated to advertising. Hence, the popularity of an ad was determined by space it occupied. But, with the advent of The Internet and its technology, an ample amount of space is available to display content and ads. With this scenario, the popularity of an advertisement (read content) is determined not by its size but its quality. Here, quality is a very broad term. Along with being catchy enough to grab user attention, the content also have the potency to capture the viewer's mind. In order to do so, it must contain something for which the viewer already has a penchant for, something the viewer is already looking for. And thus again, research of trending topics become an important aspect of producing quality content. Google being the most popularly used search engine allows one to find out what people are searching at the moment and how its search trend has varied within the last 24 hours. If one is interested in posting a new article every week then the best topic for the content can be easily chosen by following Google Trends for one full week. 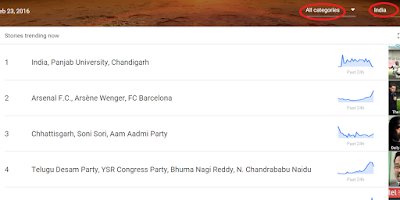 Another interesting feature of Trends is that it also allows us to choose the categories for which we need search trends. One can also find out the topics trending in their own country or the World. Posts trending on two of the biggest social media platform namely Facebook and Twitter can be obtained using Tweetdeck and Facebook trends respectively. Tweetdeck is a free and easy to use feature provided by twitter. 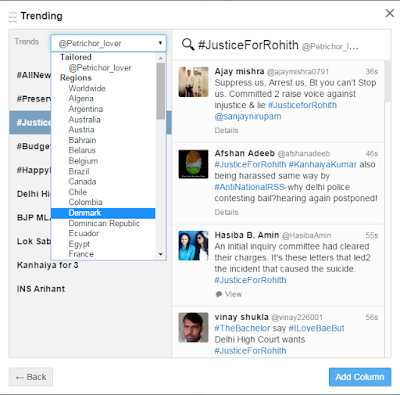 A large number of people express their opinions on trending issues via tweets. Hence, the topics trending i.e. the topics about which maximum number of tweets are generated is found in the ‘trending’ section of Tweetdeck. Trending topics pertaining to a specific region can also be gathered using this feature. Similarly, on the right hand side of Facebook’s timeline, topics trending on Facebook can be found. Being the most widely used social network, Facebook reflects what majority of the users are looking for, on the social media. Reddit is a place that aggregates jokes, news, and interesting tidbits etc and ranks them according to the number of people who have up- (or down-) voted the post or comment associated with it. 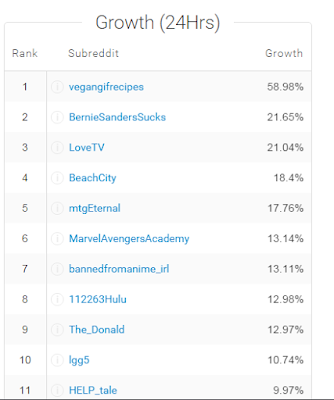 Redditlist is a feature of Reddit which shows the growth in the amount of content generated on a topic in the past 24 hours. This can be used to find the most popular topics on Reddit and their growth variation. Apart from being the biggest content and news generating website, Buzzfeed’s trend section gives readers a look at what’s popular on its own site and around the rest of the web. Real time, hard-hitting news stories are also shown in this list. Quora is a popularly used website which displays content in ‘Question and Answer’ format. The left hand side of Quora home page contains a ‘trending now’ section. However, this section cannot be customized for categories or regions. UberVU is a social media analytics tool provided by HootSuite. It has a built in data analysis tool that helps to find out the most important things happening on social media with its ‘Signals’ feature. Spikes and Bursts in activity, new trending stories, real-time influencers, and more can also be tracked using the same. Using these techniques one can come up with trending topics for their blog but this is just half the battle won. Popularizing the created content is equally and at times more important than merely creating it. With growing inclination towards inbound marketing, the scope of content marketing is all set to reach its peak. We are soon to witness a new era of marketing.